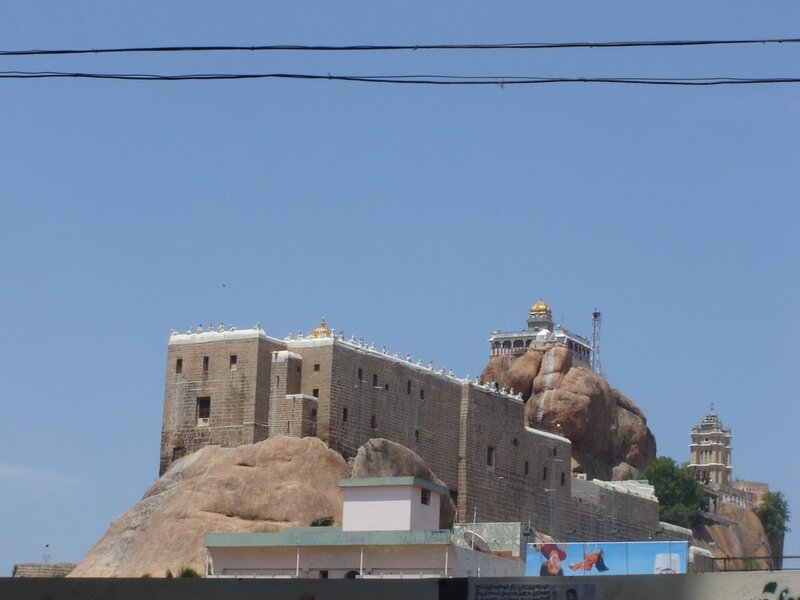 walking up the Kailash of the South, as they call it - the Rock Fort Uchi Pillaiyar Temple in Tiruchirapalli. From the stagnant waters of the Cooum in Chennai, I travelled by the banks of the gurgling waters of the Cauveri, almost on a temple tour...visiting two ancient Parikara Sthalams at Tiruvedikkudi and Tirunaraiyur in Kumbakonam, the Brihadeeshwara, Kothandarama and Mariamman temples in Thanjavur, Uchi Pillaiyar and Thayumanaswamy temple, silence at the Mouna Swamigal Mandapam in the same hill, the Akhilandeshwari and Jambukeshwarar Temple and finally the Sri Ranganathar temple in Sri Rangam. In a span of just one and a half days of walking the temples, my mind was filled with the divine images with all their beautiful alankarams. The moment I closed my eyes back home, all I could see in my mind's eye was the reclining, seated or formless presence of all the gods I saw...I felt like I was a member of such a big divine family. 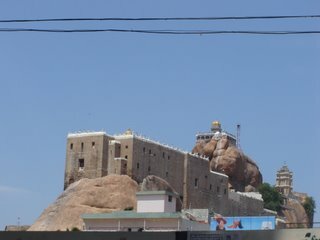 Though the rock looks formidable to climb, the first few steps to the Thayumanaswamy temple were steep. But the two flights of rock stairs leading to Ganesha are simple yet simply superb. The fish eye lens view of the whole temple city of Tiruchi with towering vimanas on all sides, the beautiful Cauveri threading around on one side and the wisp of chill air streaming through the grills from behind the Ganesha's sannidhi where I sat in meditation...hmm...it was simply divine and beyond words. A great prasadam even before Ganesh Chaturti it was for me. Going back to the north after about 10 years was indeed very nostalgic as I walked out of Delhi airport to take a car to Haridwar. I had heard a lot about this place and it seemed to be my year for cleansing! If Rameshwaram was not enough, I found myself looking forward to a dip in the Ganges as well. Ah! The Ganges, I had read so much about it in the books, the great River Goddess, the Goddess who washes off our sins, the river that takes a millions souls to heaven. The river that is now polluted, the river that purifies the soul, the Ganges. I wondered about the Ganges as I sat in the car and headed towards Haridwar. The land of the Kumbh Mela, the land where a thousand Rishis have come to sing countless praises of this mighty river. It felt strange as I thought of Shiva Gangadhara, as Ganges stayed locked into his knotted hair till she was finally set free to flow down to Bhuloka and wash away the sins of Bhagiratha's ancestors by flowing over their ashes and releasing them to heaven. It was clearly the reason why we continue to burn bodies along its ghats... A hope we reach heaven and not come back in rebirth to suffer another life. Thoughts went by furiously about how mythology has shaped our lives, about how Rishis left stories behind for us to follow a way of life and about how we try so hard now to recollect all this and give up saying we dont need it in this age anymore. I looked out of the window to see the car zipping through greenery, with mad highway traffic almost killing people on the road. And then the excitement mounted, I was reaching Haridwar, a land I had once visited, of which I knew nothing now but looked out expectantly from the car hoping to catch a glimpse of the Ganges. My heart started to pound, the excitement rising ever so high to see one of the most celebrated rivers in the Indian mind. Ganges appears every where. 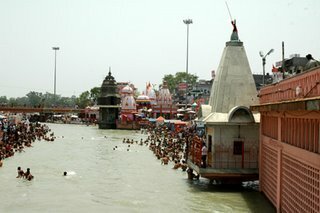 In ritual Ganges is worshipped first while bathing with the words "Aham Gangai Namaskaromi". Ganga devi is worshipped during ritual with certain hymns attributed to her. Ganges appears as a Goddess on the carved brackets of pillars at temple entrances as well as on cave temples across the country. Ganges stays locked in Shiva's Jatamukuta in ancient sculptures of Shiva Gangadhara and Ganges water is the purest in temple ritual. The power of Ganges was just fictitious till now until I entered Haridwar to take a dip in this Great river. The first sight of Ganges sent goose pimples through my skin. She spoke pure volume and power. The ghats at Haridwar seemed to be built to just direct her carefully but not enough to try stopping her. As I descended into the river down the Ghat steps, the chilling waters of the Ganges just ate into my marrow. Oh God this was not simple and I was there for a "Darpanam" in the Ganges and it suddenly appeared tougher than I thought. The steps are steep, and the iron rods are too far away to reach. My knees and feet had to brave it, the current was a little too strong. Six steps down and shivering in the water with the temples of Haridwar towering above at the other end of this vast river was an experience in itself. I felt small, weak and shivered as I held onto my dear self and prayed to the Goddess to not get any stronger on my knees. While I said my prayers I admired her. Ganges has character, she is wild and furious and reveals the same power that Bhagiratha had prayed to Lord shiva to help control. They say she would have destroyed Bhuloka and washed away this world... I would believe that. She had the power to do anything as I watched her flow by so fast. She was not going to stop. She is mind blowing and daring at the same time, challenging anyone to enter her waters. She is beautiful and defines the power of a Goddess in a single force. She is well respected and speaks a world so different from what we live in. A world so pure, so full of faith, so close to my heart and yet so far away. I am speechless when it comes to describing the Ganges. She is an experience, blessed are those who step into her waters for her waters just cleansed the mind and soul. Ganges is truly a Goddess well worth worshipping. Simply Divine. power that gives the fruit of actions effortlessly alongwith grace. who recognize the underlying Unity. "Dheera" is a very familiar word to one who is familiar with Sanskrit Holy scriptures. "Dhee" means higher intellect. Sri Ramakrishna Paramahamsa has an interesting similie to distinguish higher intellect from intellect. An intellect which is used for simple things like calculating profit and making money is like "thin curd". Chchaas in hindi, Majjige in Kannada, Majjiga in Telugu and Mor in Tamil. An intellect that is focused on achieving God is like "thick curd". Dahi in Hindi, Mosaru in Kannada, Perugu in Telugu and Thayir in Tamil. "Dhee" appears in the Gayatri Mantra also. "..Dheeyo yonaha prachodaya aath". Somebody once asked a learned monk, "What is the immediate benefit of living a morally upright life?". The monk answered, "It sharpens and brightens the intellect. Thus making it ready to achieve Divinity". To achieve the higher intellect we could start living a morally upright life. "Dheera" is a person who has turned his attention within to make the discovery of inner Reality. "Dheera" is one who is a "viveki" (One with the power of discrimination). The Mind is an interesting thing if you can call it one. It has the ultimate power of discrimination. But that power is dependant on the atmosphere in which the Mind is. Outside that atmosphere the mind might not be able to attain the same level or power of discrimination. Sri Ramakrishna Paramahamsa used to give a simple example to illustrate this: A sail boat in ordinary condition can be easily directed with the help of changing the direction of sails. But when the wind is blowing heavily, it is tough to control the direction of the boat. Similarly the wind of Senses hijacks the "Buddhi" to somewhere else. Senses are the means to identifying the external world. Once the senses become our Master, we become their slave. Senses are like Horses tied to a chariot controlled by a charioteer called "Buddhi". If the horses begin driving the Chariot then the charioteer should start controlling. But usually, it doesn't happen. The horses go where they want, the charioteer just follows. Wherever the "Buddhi" dominates the power of will is seen. It is the "Buddhi" - the Power of discrimination to be cultivated to attain the higher intellect. The greater the Self-Control, the Greater the Buddhi. People are generally heard saying, "Kathopanishad says God is everywhere, then why cannot we see God?" In simple words, not everybody can see God. We are not competent "Yogyata" to see God. We need to develop the competence to see God. When a person has developed that "Dhee" - intellect and courage - only then can he make the search of Shashwatha Shantihi - Eternal Peace. In their ignorance people make the sin of considering, the changing as the Unchanging, impure as the Pure, Source of unhappiness as happiness and loss of Eternal Reality is mistaken to be Eternal Reality (meaning that Body is considered to be The Aatma) . The Original Sin is to consider the Body as the Aatma. After this sin happens, everything else just follows. Once a person is into this Sin, he gets only ephemeral happiness. Camels have this desire for thorny plants for food. Whenever they eat those plants they are happy that they are eating what they wanted. But those thorns prick their mouth and they start bleeding. This is ephemeral happiness. He, who has the ability to discriminate the Eternal from the ephemeral, destructible from the indestructible and is able to find Nitya amidst Anitya is the one will experience Shashwatha Shantihi eternal peace and not the others. After a long time I attended the discourse at Ramakrishna Ashram on Kathopanishads by Swami Atmashraddhananda. Here is a write-up of whatever I understood there. Swamiji started off with reading out the sloka and then started explaining it in his inimitable style of raising questions and answering them. Those who have not known the (nitya in sanskrit)Reality of eternal truth will never find peace - eternal happiness in other words. As long as we think that Reality and we are something different we will never see it. Reality is inside us, rather reality is us and we are reality. This Reality is permanent, it has no beginning and has no end. Hence it is the ONE. Eternal peace is for those who see the Reality and not for those who discriminate. Spirituality is a quest for the Reality. It begins with the question "Is there something Real in this world?" and finding the answer is the end of the journey. Let's take the learning curve of a child for example. He begins with an understanding of the moving and the non-moving. A cat moves and a table doesn't. Pleasurable and not-pleasurable is the next stage. Here he does not think whether it is beneficial or not, it is all about pleasure. Next stage is Good or Bad. And so on there are various stages. But very few people can come up with the question of Real or Unreal. More often than not, when a person undergoes a very strong experience is when he comes to this question of Real and Unreal. For others it is just between pleasant and unpleasant. For others it is all matter(that which can be sensed through our senses). But as per our Upanishads and other Holy writings of the Hindu Religion and according to the Lord Yama, it is Nitya from which everything has come. All material is a form of thought. The Upanishad thought varies from the mechanistic thought in this manner about Nitya. He, who has the ability to discriminate the Eternal from the ephemeral, destructible from the indestructible and is able to find Nitya amidst Anitya is the one will experience Shashwatha Shantihi eternal peace. 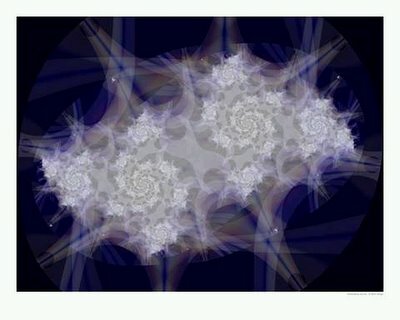 A small story to better understand eternity and the ephemeraless. The Lord of Rightenousness Yama wanted to teach the Pandavas a lesson. While under exile, the Pandavas wandering in the forests felt thirsty and so they rested under a tree. Yudhishthira instructed Nakula and Sahadeva to find if there was any water source nearby. Nakula and Sahadeva climbed to the top of trees and surveyed the surrounding. They couldn't find any water per se but they saw a certain kind of trees that grew only near water sources. This also points to the knowledge of flora and fauna that the people of those times had. They inform Yudhishtira about the same and they proceed towards the spot to find a lake. In the meantime, Lord Yama has taken the form of a stork and is standing nearby the lake. Sahadeva proceeds to get water for all of them. Then the stork speaks. Ok, let's just assume that they understood each other's language if you find a stork speaking to be so illogical. It is an altogether different topic that we don't understand a fellow human being's language itself! A stronger indication of the harmonious living between the flora and fauna and the human beings. successfully, you may take water from here and go". comes in contact with the water, he falls down dead! The same fate befalls Nakula, Bheema and Arjuna. After waiting for an inordinately long time, Yudhishtira himself makes it to the lake and encounters the stork. Immediately he realises that it's not an ordinary stork. And he pauses to take the quiz voluntered by the stork. This quiz is the famous "Yaksha Prashna" that we have come to know of. One question in that quiz was related to eternity and ephemralness. The Stork (in-the-form-of-Lord Yama) asked, "What is the latest wonder?" he is going to die"
Later on, Lord Yama shows his true form to Yudhishtira after being pleased with his answers. And also brings all his brothers back to life. The point here is that, we are Eternal (Nitya). But this Body is not. We realize that we are eternal but restrict the understanding to our body-mind consciousness and hence we are fearful. When we approach Divinty we become fearless. Identification with Anitya is why we never see the Eternal Truth. Temples come in different shapes and sizes. There are the famous and the remote, the big and small, common and unique. Each temple has its own personality. As the car turned left, I could see the Gopuram (Main Entrance) of the Chidambaram temple. A thrill shot down my spine. It is not a religion oriented feeling. I have felt the same at a church in Ahmedabad/Velankanni, mosque in Chennai and temples all over India. I will type what I feel about a place of worship - called Temple in general.A temple is a structure reserved for religious or spiritual activities, such as prayer and sacrifice, or analogous rites (as in masonry). It is a general term for a house of worship. - Thanks, Wikipedia. As I enter the temple, I see a huge courtyard. I sit down and think about why am I mad about temples.Religions have been found temples as an attempt to bring discipline into the lives of its followers. Temples help us cultivate and maintain the discipline. Temples bring about a sense of awe about the glory of God who is present within each one of us.Let us take a famous temple like the Brihadeeshwara temple at Tanjore: After roughly 1000 years since completion this temple still inspires awe about how man can create such an architectural marvel. After one starts admiring the building, there is a feeling of awe about how God who is housed in the temple must be bigger. If they were not getting satisfaction why must people sacrifice their joy to construct such a monumental edifice as an offering to God. What does life contain - a feeling of loneliness, a place to fill up pent up emotions, joy of living and a sense of achievement. All these feelings are reflected in temples through various art forms. As people of different kinds walked by, I got a feeling of amazement - how many people would have visited this temple and prayed for success, land, wives and what not. All of them would have carried out prayers, felt happy when their prayers were answered, felt sad in case of misfortune. In all these years, the chidambaram temple would have seen so much of human emotion.The temple is a standing image of human successes/failures and excesses/shortages. Prayers definitely have theraupatic value as one thinks about his own life in this environnment, he comes up with plans to succeed and ways to improve. Finally there is a feeling of emptiness, a kind of satisfaction and responsibility.The loneliness which characterises one's life is temporarily lost. When a human mind concentrates on anything, he becomes successful in it. Temples helps one to concentrate on one's own life and carve out paths of success.This is the success of a temple as, one feels happy at the end of the visit. when i try to gauge the intricacy and skill needed by the Divine, to have woven out of Himself, in His own image, and with His own substance of Truth-Consciousness-Bliss this beautiful world and its people and other life forms, not to forget all inanimate and animate components too, i am filled with a tremendous wonder and awe, a supreme gratitude and a conviction and certitude that "God is Here, not just in Heaven - and all IS indeed right with the World!"